We are going to start updating this regularly. It was a lot of fun writing to everyone from the road last summer, then we sort of let this die. We are playing a bunch, and lots of noteworthy stuff happens from show to show. It seems like a good idea to keep a little online touring journal. So here we are. Anyway, thanks for reading on. I am now going to try to post a picture with this entry. It should appear on the top of this paragraph if all goes well. 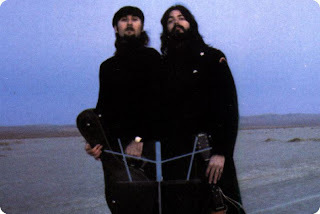 It is this cool picture of Seals and Crofts from one of their LP covers. Those guys wrote that tune "Summer Breeze"... reminds me of camping. Anyway, check back now and then. I plan to write in here a bunch. See you out there.